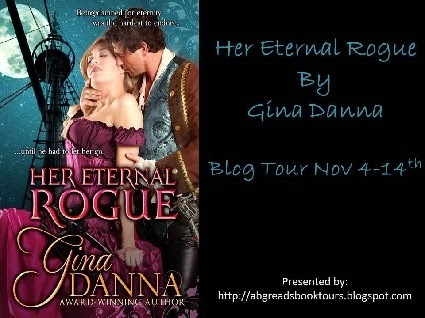 Please help me welcome author Gina Danna to A Buckeye Girl Reads. She's here today talking about her newest book, Her Eternal Rogue, a vampire historical romance! Alexander Barrington flees his tyrannical uncle for the open seas where he becomes a ruthless pirate who turns vampire. Captured and sentence to hang, a fate he must avoid to keep his vampire self hidden, a reprieve comes if he rescues Lady Lavinia Sinclair from the French pirates and returns her to her betrothed in England. Alexander falls for the woman who makes him feel human and alive, but can he really have her without exposing what he is – a thief, the undead? The damned? Refusing to taint her innocence any further, he erases her memory of him and vanquishes into the night but can he really exist without her? What was the inspiration for Her Eternal Rogue? It was a combination of things. I read a lot of Regencies so I wanted that period. I loved Pirates of the Caribbean so wanted to do a pirate. At the same time, my local RWA chapter was talking about hooks & what was to hook of your story? Well, I loved True Blood & just started Vampire Diaries, reading Vampire Academy series so I thought what if my pirate had a dark side & was a vampire? Alexander, my vampire/pirate. He was complex, dark character with huge depth because of his story - runaway nobleman, sailor turned pirate turned vampire. What character was the hardest to write? Lavinia. I find I like my heroes a lot so they're easier than my heroine. It'd be like writing about me which I can't do. The reunion scene - where she turns in bed & he's there. She wants him out, he says he can do what he wants, take what he wants because he is a pirate (nevermind he's a vampire and can do so with more command than a pirate - he hits in a way she can understand that is somewhat scary but doesn't make her afraid of him. Makes her mad, actually. Fun to write. Was there a lot of research for the book? What was the most interesting thing you found? Yes, I did a lot of research. I'm a historian by education therefore I want the story to be given the most possibility it could have. The ship was what pirates used, the ranks of the pirates, the language, the personalities, the history of vampires - how what we take as normal vampire issues (no mirror reflection, unable to be in sunlight, etc) was all Bram Stoker's doing in Dracula. Research showed what scared people the most was the fact that vampires looked normal, like everyday people. Most interesting thing I found? Probably the incredible history of both pirates and vampires. Pirates are a people/"nation" so to speak, of their own. The unable to govern yet they had their own laws, all subject to change. And the bit I stated above about vampires. Fascinating.